Rocky Patel's take on how to create the perfect cigar. Making a breakthrough in the jealously guarded cigar industry has not been a smooth journey, brand owner of Rocky Patel premium cigars admits candidly, fifteen years after his foray into the business. Little had the then attorney for movie stars imagined that the hours spent socialising with Hollywood A-listers would ignite a passion for cigars that would eventually change the trajectory of his life. Patel found himself getting inexorably drawn to the sheer beauty of rolled tobacco, as actors puffed away between sets. Since then, there has been no looking back and he has taken it upon himself to challenge every myth of the cigar industry. Once derided for being an outsider, he picked up skills that any seasoned tobacco farm owner would be proud to have. Reminiscing about the first few hard years, Patel has no regrets about sticking to his guns and implementing out-of-the-box ideas for blends. 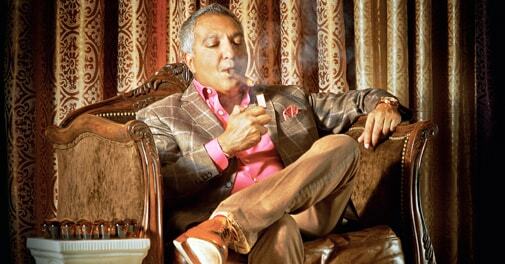 The hallowed cigar industry was finally forced to take cognizance of Patel and his sheer depth of understanding and passion for cigars as he swept up accolade after accolade. With a kitty of +90 rated cigars under his belt, Patel still doesn't take a moment's rest. From making visits to his factories across Honduras and Nicaragua to the farms from which the tobacco leaves are sourced, Patel takes pride in overseeing every stage of the process. The strictest quality control during production and rigorous testing procedures are in place to ensure that the finest sticks reach the market. The cigars are a beauty to behold - the iconic logo of the brand in dull gold adorns the wrapper. The man behind the brand was at his affable best at Cigar Conexion, held on January 20, to celebrate their 15th anniversary with the launch of 'The Decade'. A medium-plus cigar with a Sumatra wrapper, the Decade has received glowing reviews and been rated among the top 25 Cigars of the Year by Cigar Aficionado. The perfect blend of smoothness and spicy, the potent smoke has a filler of blended Honduran long leaves. The Decade's rich and creamy texture with distinct notes of black cherry, topped off with a nutty finish, has complex overtones that are very well balanced. Try this one for perfection!